Is your customer looking to upgrade his shower area or completely renovate it? 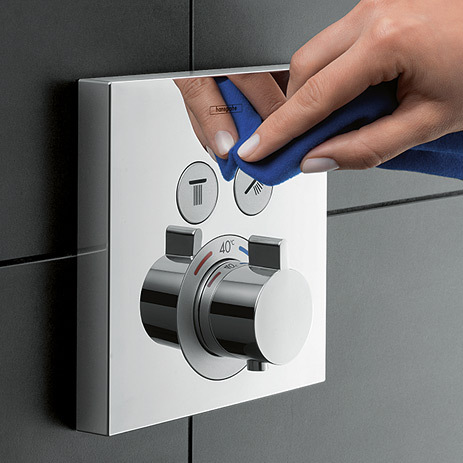 Here you will find the three key types of installation for hansgrohe control elements featuring Select technology. All good sales points for you to use in your consultations. The intuitive Select operating and design concept is user-friendly and elegant, particularly when it comes to concealed installation. 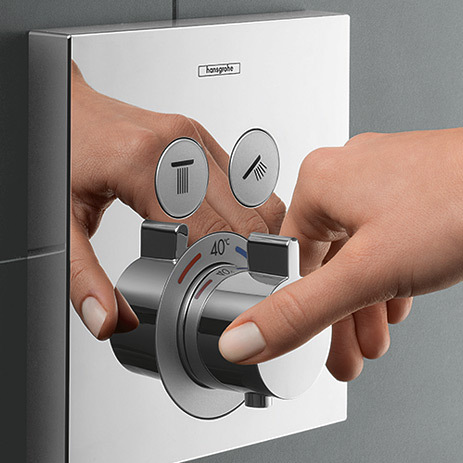 On the ShowerSelect pre-fab sets, up to four consumers can be switched on and off at the touch of a button. The different types of shower jet can be selected with equal ease. Top-notch thermostat technology to suit every customer. 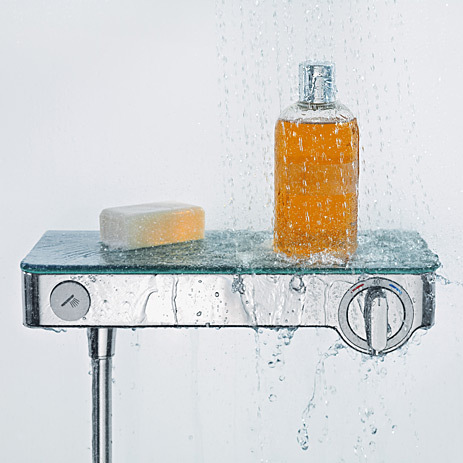 The pre-fab sets are available in different versions and can be universally combined with all showers. 1. 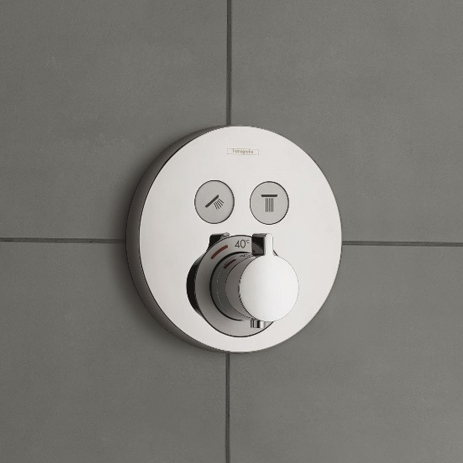 ShowerSelect thermostats with integrated hose connection and shower support – elegant, easy to install in bath tubs / showers. When should ShowerSelect pre-fab sets ideally be installed? 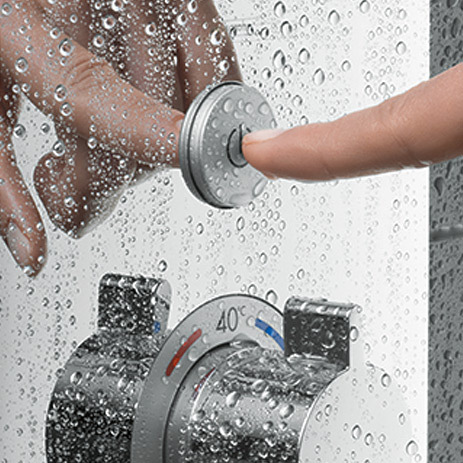 For the control of shower solutions featuring one to four consumers. Convenient: they make simultaneous operation possible. If the iBox universal is already installed, they are really quick to fit. When renovating, you can easily replace the existing pre-fab set. If you customer has a small bathroom, then this solution saves space. Attractive bathroom design and operation at the touch of a button. The pre-fab sets are available in two design variants (round or square) and in three surface finishes (chrome, with white or black glass). 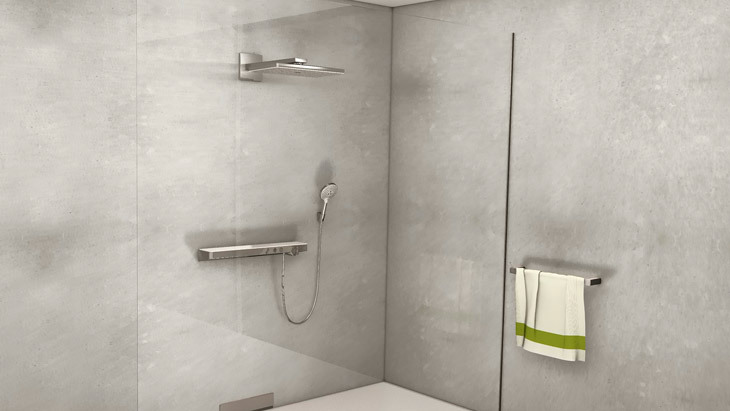 hansgrohe concealed installation solutions have won numerous awards for their visual appearance and ease of use – not to mention their barrier-free design. 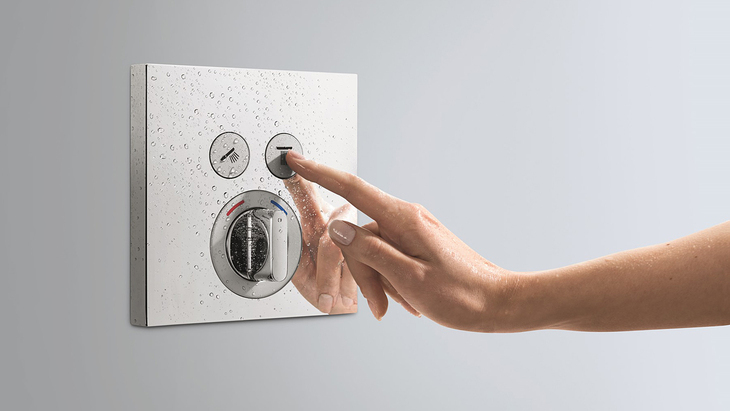 hansgrohe also offers the clever Select buttons in its exposed installation solutions, for example on the ShowerTablet Select 300, a thermostat of exceptional convenience and design quality. Extremely user-friendly. The Select elements can be conveniently accessed from the front and are easy to press. 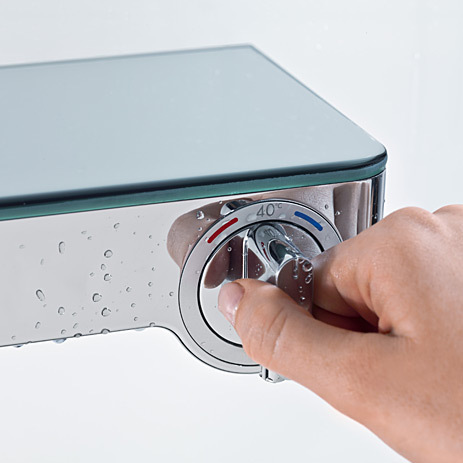 The required temperature is selected via the ergonomic control dial. Further advantages: large symbols and colour coding. All this makes it ideal for children, older people and those with limited mobility. The flat shelf area made of safety glass (300 mm) offers space for shower utensils and is easy to clean. New: the best of both installation worlds. 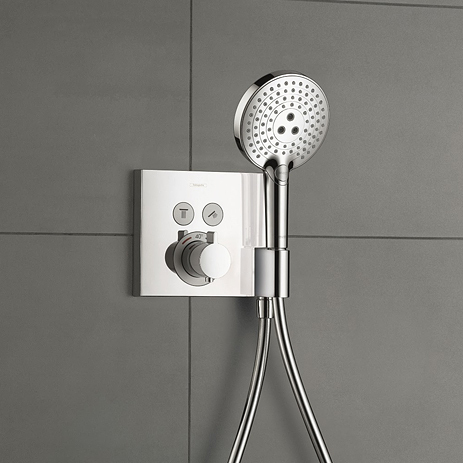 The ShowerTablet Select 700 exposed thermostat can be combined with any single-jet overhead shower. Added bonus: the Tablet actuates the shower via a concealed installation. The connection between the two is invisible: implemented via a pipe in the wall. Even the installation of such a large thermostat presents no problem: it is easy to install on the wall. More freedom in the bathroom – and more convenience within the living space. 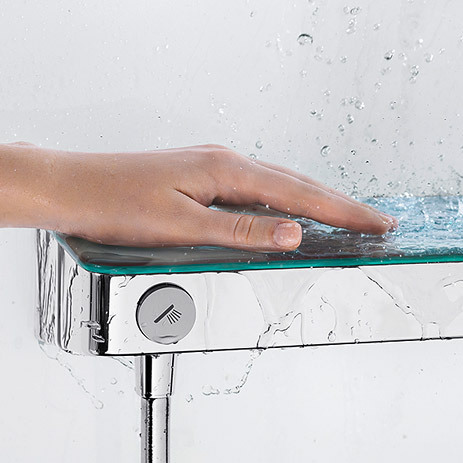 At 70 cm long, the flat glass surface of the Tablet creates unprecedented storage capacity for shower utensils. 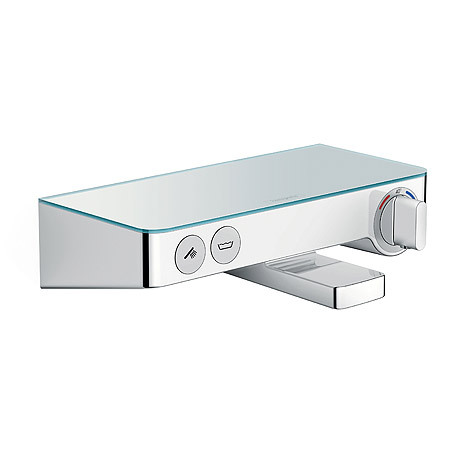 Elegant design: the safety glass is situated on a body of chrome-plated metal. 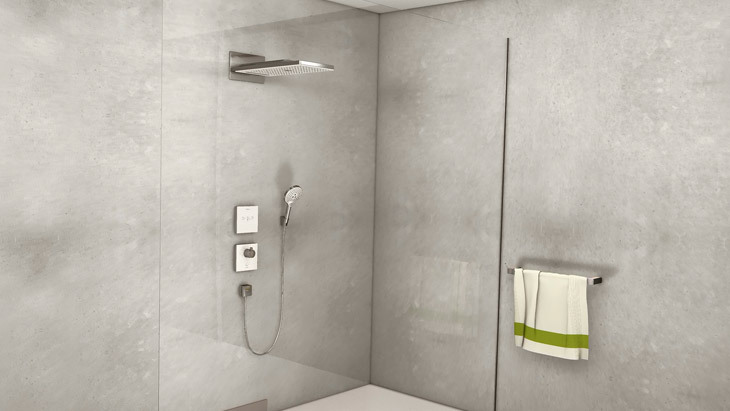 Particularly harmonious from a visual perspective: combining the Tablet with a large overhead shower such as the Rainmaker Select. The thermostat also constitutes a multi-functional highlight around the bath tub. 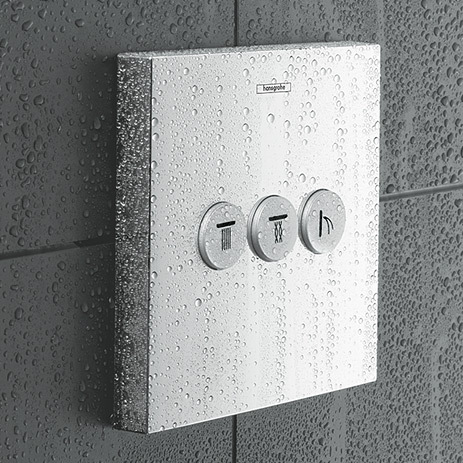 In addition to Select, hansgrohe also offers other mechanical – and electronic – control systems for the shower. Check out other solutions here.